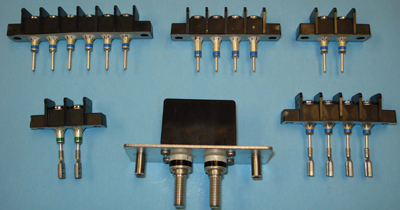 Corry, PA -- Corry Micronics has released their barrier style filtered terminal block product line for direct sale. Don Pavlek, President and CEO of Corry Micronics stated that the company has been manufacturing industry-standard filtered terminal blocks as an OEM supplier to the industry thru an exclusive arrangement but effective November 15th has been cleared to sell filtered terminal blocks directly to the end user. Corry Micronics offers a full line of standard and custom barrier style filtered terminal blocks. Micronics' F-36 (#6 screw size) and F-38 (#8 screw size) terminal blocks are rated to 30 and 35 amps respectively, and have become the industry standard for many telecommunications companies. Capacitive "C" and Pi filtering options are available with a standard capacitive range of 1,000pF, 2,500pF and 5,000pF in the Pi configuration, and up to 10,000 pF in the "C" configuration. The F-36 and F38 series terminal blocks are available in 2 to 6 poles. Custom configurations are also available. Call our sales office today to find out how other customers have been able to reduce their lead times and cost by an average of 7 percent. Contact Micronics' Sales Account Manager, CJ McBride at 724-940-7556 ext 138 or by e-mail at cmcbride@cormic.com.